I bought this book thinking that I could get some inspiration, and also learn more about how other artists create art. The book fulfilled both criteria but somehow I still felt the book was lacking. 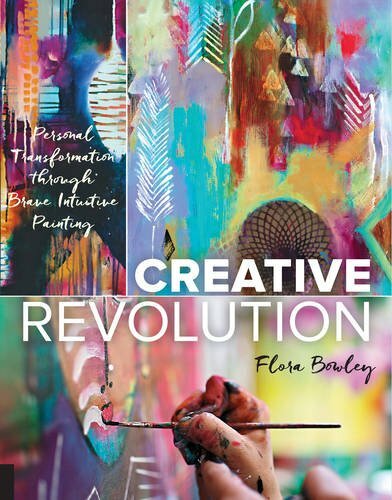 The author Flora Bowley had published another book by the name Brave Intuitive Painting in 2012. I looked at the reviews from that book and it seems that all that was said can be applied in this new book too. This book is about engaging your mind and spirit to create art, and hopefully help you be more creative. The focus is about using art as a creative outlet. If doesn't matter if you don't know how to draw and paint, this book doesn't teach much on that either, but it matters that you enjoy what you're doing, creating. In Flora's workshop, she has her students meditate, do yoga, dance while having mini breaks, hold hands around a lake, paint with their hands and legs and paint without using your eyes. Those are just some of the unorthodox methods she uses. There are more. The artworks you can expect to see are abstract. Sometimes it's Jackson Pollock abstract, other times it's like what-going-on-here abstract. The photographs are artistic shots of people doing yoga, close up of hands covered with paint, people enjoying themselves, and oh, some artworks from her students as well. There's no right or wrong way to the process of creating art. Different people also have different preference to what they like. So if you're someone who likes what you've just read, then this book could be for you. If not, then you should probably avoid this. Flora's stories are inspiring, but I wished that she had included more practical instructions. Maybe she did include instructions, but the steps don't create the type of art you're looking for. If you happen to like this book, you can also check out Expressive Drawing: A Practical Guide to Freeing the Artist Within.